12 gram CO2 cartridges are compatible with any airsoft gun, paintball gun, airgun that requires a 12gram CO2 cartridge. CO2 power allows you to shoot in rapid succession. CO2 cartridges also allows you to quickly replenish the power source, without the need to recharge (such as with an AEG). Don't jeopardise your game because your gun lacks of juice. Use CO2 guns and just don't forget bringing cartridges. Provides a strong and consistent power source for your airsoft competition game that does not require recharging. You will need a CO2 compatible airsoft gun. NOTE: The 12g unthreaded CO2 cartridges are NOT designed for CO2 Drain Line Cleaner or CO2 Tire Inflator. They normally use 16 gram cartridges instead. Please refer to your product manual and buy the correct type of cartridges for your own device. 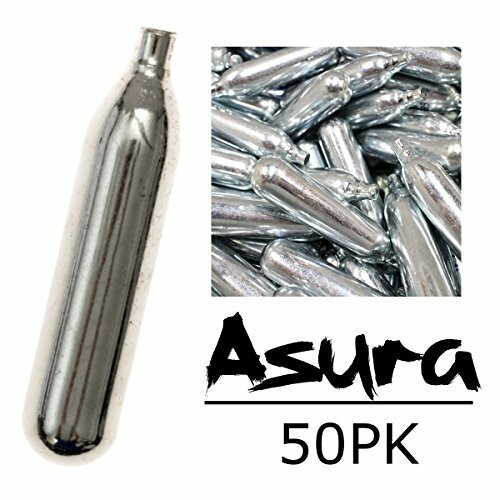 If you have any questions about this product by Asura, contact us by completing and submitting the form below. If you are looking for a specif part number, please include it with your message.